Preheat oven to 325°. Securely wrap a double thickness of heavy-duty foil (about 18 in. square) around and under a greased 9-in. springform pan. Combine crushed gingersnaps and sugar; stir in 4 tablespoons butter, adding more as necessary. Press onto bottom and 1-1/2 in. up sides of prepared pan. Beat cream cheese until fluffy, gradually adding 2/3 cup honey, lemon juice and minced ginger. Add eggs; beat on low speed just until blended. Fold in 1 cup chopped pears and raisins. Pour into crust. Place springform pan in a larger baking pan; add 1 in. of hot water to larger pan. Bake until center is just set and top appears dull, 1-1/2 to 1-3/4 hours. Remove from oven; remove springform from water bath. Cool cheesecake on a wire rack 10 minutes. Loosen sides from pan with a knife; remove foil. Cool 1 hour longer. Refrigerate overnight, covering when completely cooled. Remove rim from pan. In a large skillet, melt butter over medium heat. Add remaining honey and pears; cook and stir until pears are tender. Stir in pecans. 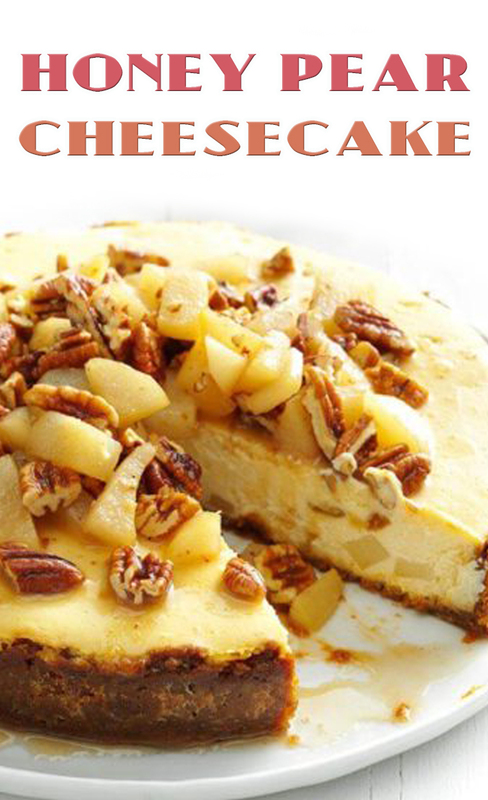 Top cake with pear-pecan mixture.